Please note that the content of this book primarily consists of articles available from Wikipedia or other free sources online. 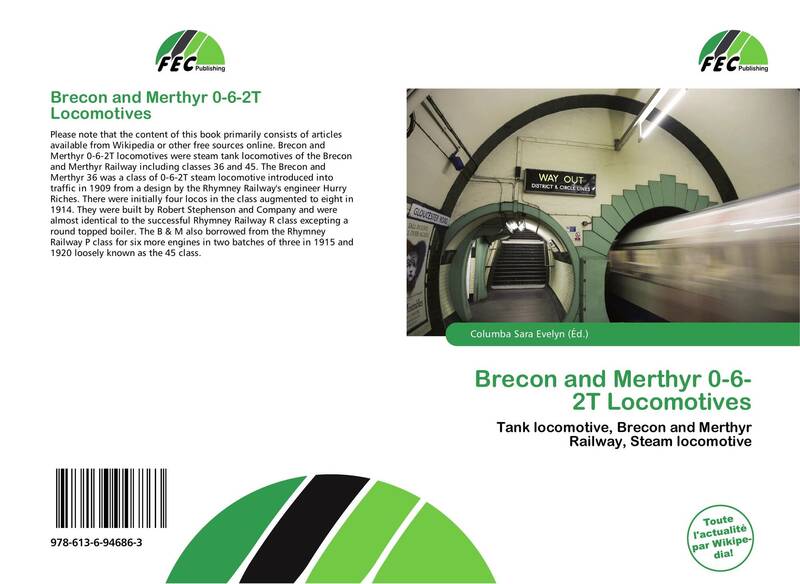 Brecon and Merthyr 0-6-2T locomotives were steam tank locomotives of the Brecon and Merthyr Railway including classes 36 and 45. The Brecon and Merthyr 36 was a class of 0-6-2T steam locomotive introduced into traffic in 1909 from a design by the Rhymney Railway's engineer Hurry Riches. There were initially four locos in the class augmented to eight in 1914. They were built by Robert Stephenson and Company and were almost identical to the successful Rhymney Railway R class excepting a round topped boiler. The B & M also borrowed from the Rhymney Railway P class for six more engines in two batches of three in 1915 and 1920 loosely known as the 45 class.